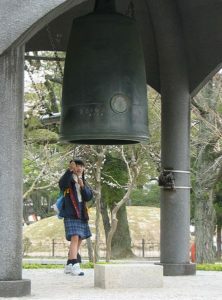 This week in the war, on 6 August and on 9 August 1945, atomic bombs were dropped on Hiroshima and Nagasaki. The necessity of using the atomic bomb is still debated today. 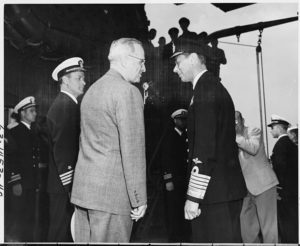 This week in the war, off the coast of Plymouth, England, President Harry S. Truman, en route home from the Potsdam Conference aboard the USS Augusta, met with King George VI, who was on board the British battlecruiser HMS Renown. Later, after he had become fully aware of the bomb’s destructive power, Leahy condemned the atomic bombing of Hiroshima and Nagasaki as barbaric. 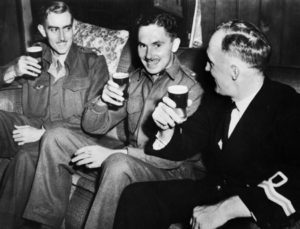 In the July general election, the British Labour Party had won its first majority in British history and, this week in the war, on 26 July 1945, Clement Attlee became the first Labour prime minister of Great Britain. The Labour Party’s platform was based upon full employment and social reform, namely the sharing of wealth through the introduction of a welfare state. 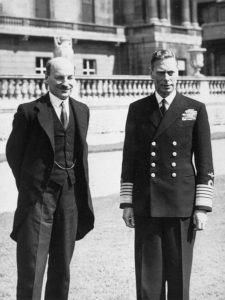 It would also become the role of Clement Attlee to take part in the final negotiations at the Potsdam Conference. The Potsdam conference opened this week in the war, on 17 July 1945. 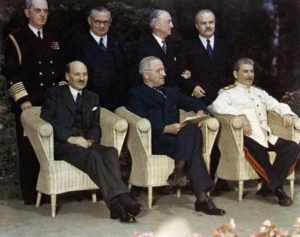 Three countries participated: The Soviet Union—represented by Joseph Stalin, the United States—represented by Harry S. Truman (who had become president following the death of President Roosevelt), and Great Britain—represented at first by Winston Churchill and then by Clement Atlee, who became prime minister as a result of the Labour Party winning the July 1945 general election. The continuation of the war against Japan was a major item on the agenda. So was the re-organization of post-war Europe, including moving the boundary of Poland westward into Germany. Meanwhile, a top-secret telegram was sent from Washington to Potsdam, to inform the US Secretary for War, Henry Stimson, that the atomic bomb had been successfully tested at Alamogordo in New Mexico. 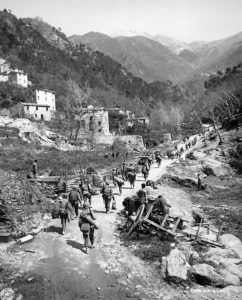 This week in the war, on 15 July 1945, the first contingent of American troops that had been serving in Europe boarded their ship in Naples, Italy, and set sail for Japan. The invasion of the Japanese homeland had been set for 1 November. American warships had already been bombarding the Japanese mainland as a preparation, and the Japanese were making preparations of their own by training thousands of men for kamikaze air and sea attacks against Allied shipping. This week in the war saw the final and sad end of Lieutenant Colonel Ivan Lyon’s Z Force. 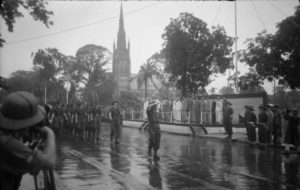 Since the fall of Singapore, Lyon had served with special forces (British, Australian and Free French) that were fighting behind the Japanese lines. In September 1943, he led a successful raid against Japanese shipping in Singapore harbor. He died while engaged in a similar raid in October 1944. All of the members of Z Force were eventually killed or captured. Those captured were executed by beheading on 7 July 1945. A photograph of future Canadian prime minister, Lester B. Pearson, addressing delegates at the San Francisco Conference is fitting for Canada Day, 1 July. 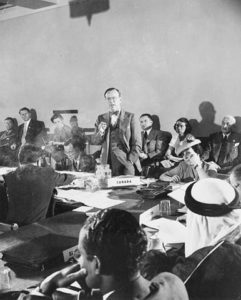 The United Nations Conference on International Organization, which had opened on 26 April 1945, ended two months later, this week in the war, with the signing of the United Nations Charter. Delegates to the conference came from nations that had fought on the Allied side. A central feature of the Charter was the agreement that the Security Council of the United Nations would assume responsibility for order in the world and that the United States, the Soviet Union, the United Kingdom, France, and China (the ‘Big Five’) would have permanent seats on the Council. 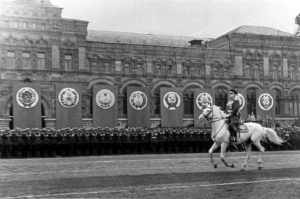 June was the month for victory parades in places as far apart as Moscow and Rangoon. Soviet soldiers carried hundreds of captured German banners and laid them before the Lenin Mausoleum. 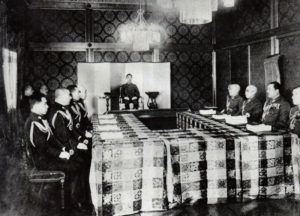 This week in the war, on 8 June 1945, Emperor Hirohito presided over a meeting of the Japanese cabinet. They decided that Japan would continue fighting until the very end. Japanese kamikaze pilots were still effective and, in his book Second World War (Stoddart, 1989), Martin Gilbert reports that, on average, an American infantryman on Okinawa could expect to become a casualty after three weeks of fighting.